This photograph was taken moments before Amanda was to walk down the aisle at her wedding. 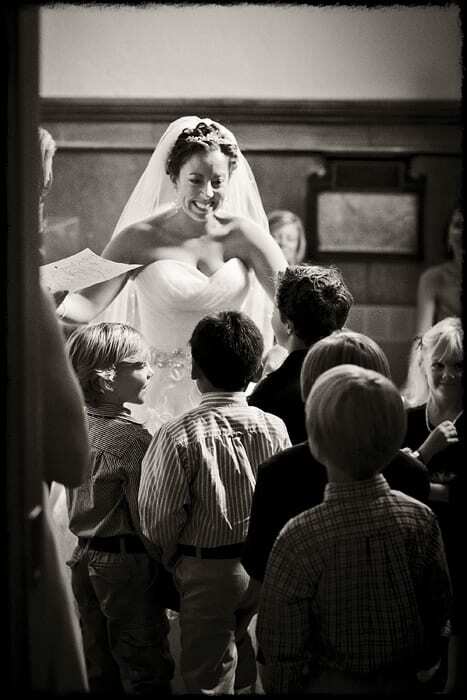 She was waiting in a rear annex of the church until the moment was right for the processional. However, Amanda was a teacher, and a group of her students insisted that they absolutely needed to see her, no matter how busy she happened to be. They found their way to her room and huddled together as close as they could, all trying to fit into the tiny space. One of the children handed Amanda a simple note from the class that read something to the effect of, “We love you,” and Amanda absolutely lit up. It was so precious to see the love she had for her kids as well as the loved they shared for her. I saw this moment unfolding but didn’t want to interrupt. I stood back with a long lens and photographed this image through the doorway. I love the way the light is hitting Amanda and how the joy on the children’s faces is clearly visible. I believe this image captured the memory of this particular group of students that just couldn’t wait to tell Amanda how much they cared for her (even if she was busy getting ready for the most important ceremony of her life).